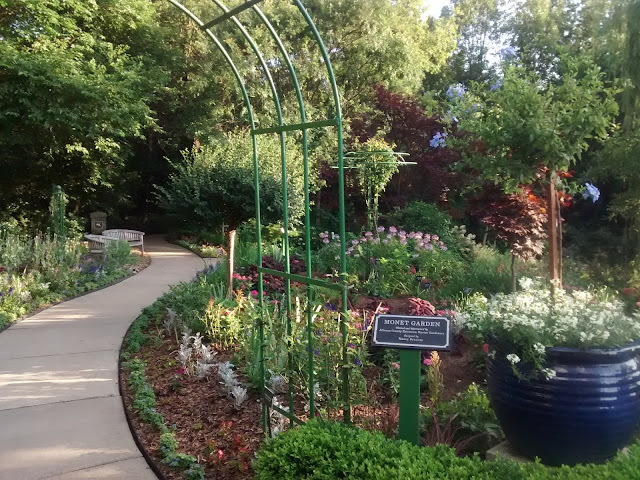 Summertime in the Kansas City area is filled with exciting events of all kinds to attend. 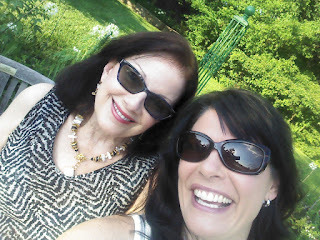 Recently my friend and jewelry designer Beth Cosner ( her custom jewelry slideshow is below on my site) invited me to attend the Stem's Soiree benefiting The Arts and Recreation Foundation of Overland Park. It took place at one of the most beautiful settings in the area, The Overland Park Arboretum and Botanical Gardens. Beth brought her sister Nancy and I invited my daughter-in-law Robin for an evening of art, music, fireworks, food from over 20 area restaurants and fine wine from Dos Puentes! I hope you enjoy some of the images from this very special evening and consider attending this fun filled cultural event next year if you are in the area. 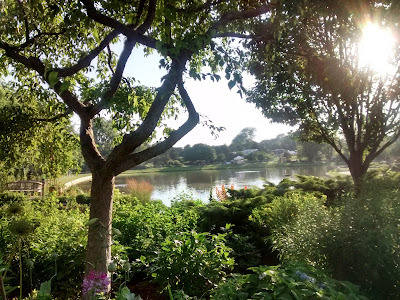 It is well worth the visit to the arboretum and botanical gardens any time! Upon arrival, guests received a hand painted wine glass to carry through the the evening for tastings. 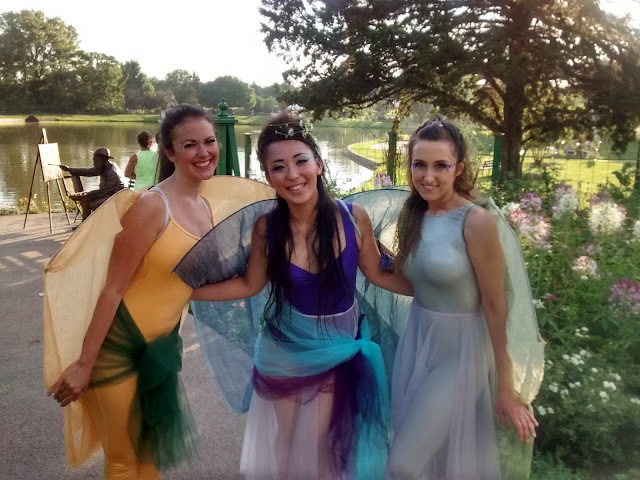 Fanciful Dancers along the garden paths! 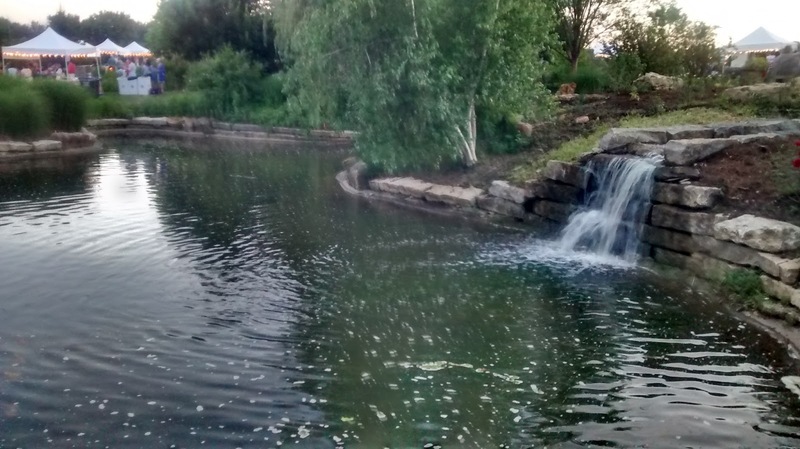 A lovely waterfall spilling over stones into the water. 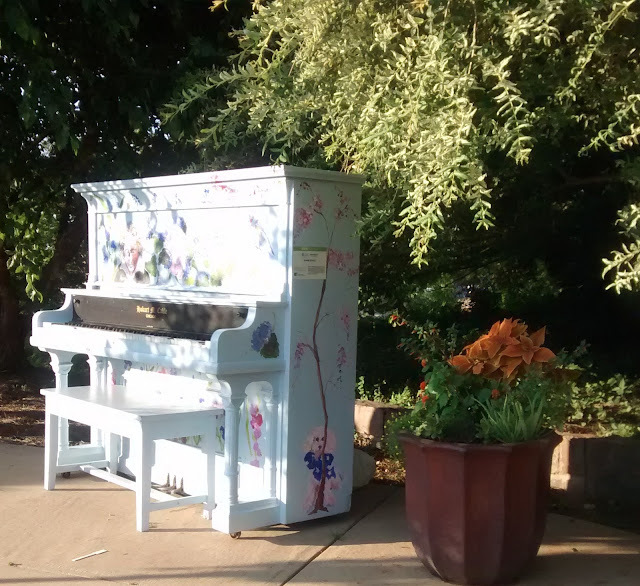 Artistic touches were found everywhere in the botanical gardens. 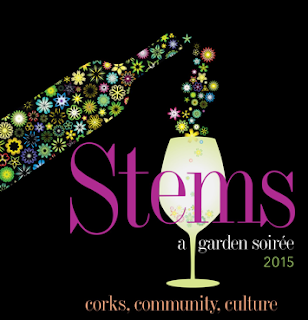 Thank you Beth for a wonderful art and fun filled evening at The Stems Soiree! Thank you to my Friends, Family and Followers who Support The Arts! Please leave a message as your comments make my day! Sign up for email alerts to receive notification of my latest features! That Sounds like so much fun! 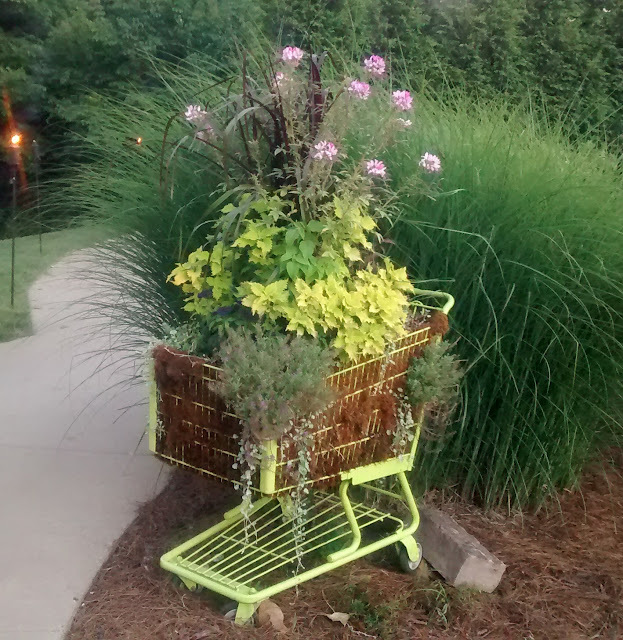 I love how they planted plants in the shopping cart..very clever! Such a beautiful setting! Looks like a lovely evening! What a wonderful event- I love things like this! You look gorgeous Karena!! Happy Summer, and if you have trouble linking to our blog, you'll need to change the link to: www.powellbrower.blogspot.com! What a beautiful party and love the idea of the painted wine glasses. So many perfect touches throughout! A LOVELY event........reminds me of my stay in OHIO the pond and everything so GREEN! What gorgeous gardens filled with such beauty and art....love that they gave you a wine glass almost immediately...what a beautiful event! What a delightful evening with perfect weather. A lot of work has gone into organizing this special evening. You look beautiful in the image posted. Hi - i had to make a new blog roll - and i noticed your blog wasn't updating?!?! you need to try to figure out what is wrong. if i click on it - it clicks on the right story - the current story - bUT your blog is at the end of the list, like it hasn't updated in years. go look at my blog roll - you can see what i mean. check with your google blogger? Absolutely magical! Glad you got to enjoy this one Karena! BTW, I just posted about the fabulous lamp I won on my blog today! Thank you again! Ah I love garden parties!! So beautiful! Absolutely gorgeous, Karen! Would love to spend hours there. This looks like a fun evening! In St. Petersburg, we have a similar event every year, when a portion of the street that faces Tampa Bay is closed off and long tables stretch right down the middle of the whole street. Hi, Karena - Your test is working!